This project for Fontys EGT who run a project building a hospital of the future by doing projects that combine health studies with technical studies. The project we got to work on, was to make a touchtable game for elderly people suffering from dementia. Starting off with deskresearch on our target audience, we got somewhat of an image of who we were to make a game for. We got a basic understanding of dementia, different phases it can be subdivided in and what the environment our game would feature in looks like. We made appointments for some field research, joining the nurses in accompanying our target audience in a care institution. We got to talk to our target audience and introduce them to a tablet, checking what they were able to do. With our research results in mind, we came up with the concept of creating a game in which the players would build a house together. The game would be made up of two parts, the building and the environment. Based on the results of the tablet tests, we decided to let the building process consist of a series of swipe or tap “minigames”. Each of these minigames having different levels of difficulty (tap, swipe, doubleswipe) to go with the different phases of dementia our players could suffer from. All of the actions performed by the target audience would result in a house being built. Our research showed that people suffering from dementia have a hard time keeping focus and seeing the big picture. For that purpose, we decided to not only create the actual game of building a house to play with, but also add several interactive elements in the environment. Our target audience is easily stimulated by beautiful looking, contrasting or moving objects and they will quickly start tapping on those. 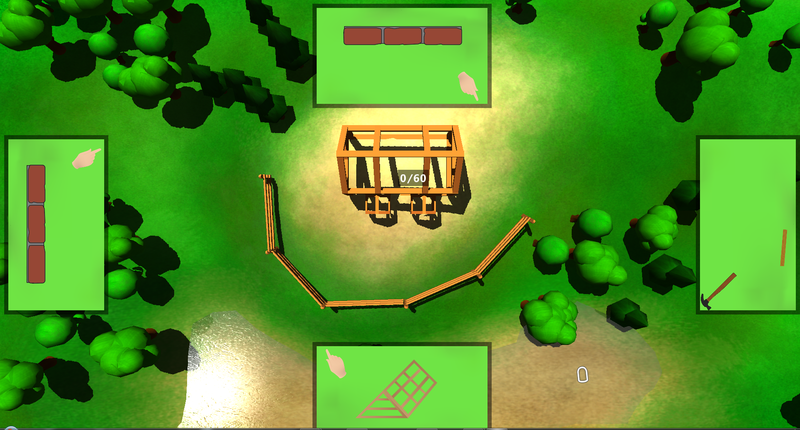 In order to build a house, players would need to collect three kinds of resources: Wood for the frame, Bricks for the walls, reed for the roof. This could be done in the three different environments surrounding the centered building ground.The players are navigated through the different environments automatically, in order to keep their amount of choices to make to a minimum (which is needed for this audience). The resources are collected by playing several 2D swipe/tap minigames. The house is built in a similar fashion. Keeping the mechanics the same over the entire game was required so our player wouldn’t lose track of what’s happening. The interactive environment, rendered in 3D behind the 2D framed minigames (to ensure a good contrast between the two) features all sorts of interactive elements. Like Water that would ripple when touching it and swiping through it with your finger and cows that would moo and animate upon being touched. Every piece of the map, with a different resource to collect, features a different 3D environment. As we developed a working version of our product, we went back to the care institution, with our touchtable to do user tests. As predicted with the research done upfront, the players were most interested by the moving and interactive environment. They didn’t quite understand the bigger picture of the game. They did however play the minigames to a certain point, as swiping and tapping them resulted in an animation of resources being collected which struck their interest. Other than that, the players mostly enjoyed just playing around with the water effects and the other environmentals. During this project, I’ve been part of the concepting from start to finish, I’ve done both desk and field research to understand our audience and come up with a concept that would stimulate our players. 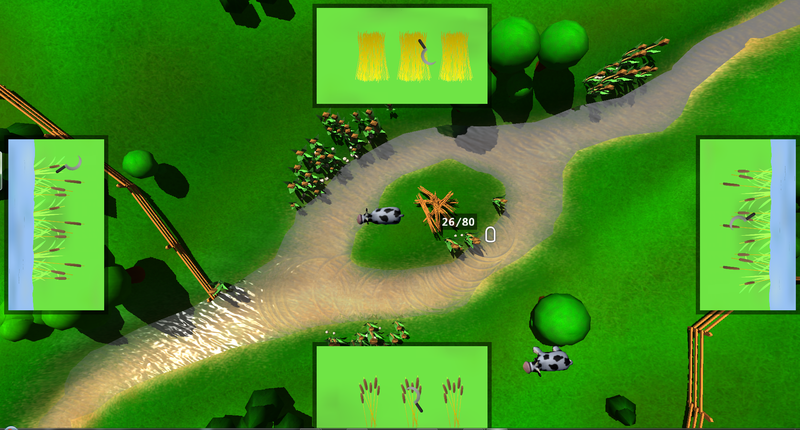 In the final product I’ve worked on creating the different terrains, done a lot of texturing and I’ve created the cow model and rigged animation, as well as creating some of the 2D-assets.